Do you own Samsung Galaxy J7? If yes, then you need to download the drivers for your device in order to connect your smartphone to a computer or flashing firmware on your device. Just follow this guide and you are good to go. Samsung Galaxy J7 is one the popular smartphone that was launched in 2015, June. The phone comes with Single or Dual sim Mechanism. The version of software installed in Galaxy J7 is Android 5.1 (Lollipop) and you can also upgrade it to Android 6.0.1 (Marshmallow). The application runs smoothly on it as it is powered by powerful octa-core Snapdragon 615 processor to support the performance of the phone. For graphics, it include Adreno 405. The phone packed with 16 GB of internal memory including 1.5 GB RAM and also support micro-SD card upto 256 GB. With Galaxy J7, you can capture memories with a good quality results. The phone include 13MP Primary camera with LED flash including features and 5MP secondary camera with LED flash for selfies. The connectivity medium include WLAN, Bluetooth, GPS, NFC, Radio and USB. It is powered by Li-Ion 3000 mAh battery to support its large display of 5.5 inches with a resolution of 720×1280 pixels. The type of display it consider is Super AMOLED capacitive touchscreen. 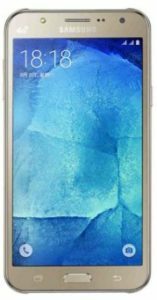 The price of Samsung Galaxy J7 in India starts from 10,990.